Average annual wages in fashion range from 26,440 dollars, for textile bleaching and dyeing machine operators, to 84,600 dollars for marketing and sales managers in fashion. About 79 percent of all US employees in fashion work for apparel retailers. The average annual wage at such companies is 26,650 dollars. However in certain occupations the average wages are a lot higher. Marketing and sales managers at apparel retailers have the highest average annual wage of 84,600 dollars. Accountants and auditors receive an average annual pay of 69,960 dollar and buyers and purchasing agents get paid 56,550 dollars, on average. A smaller amount, 145,000 employees accounting for 8 percent of all employees in fashion work in apparel wholesale and merchandising. The average annual wage in this sub industry is 52,350 dollars. However, some jobs pay less than the average wage. Graphic designers, for instance, receive wages around 48,320 dollars, whereas merchandise displayers and window trimmer receives 35,680. Jobs in production, planning and expediting, with average wages of 47,680, and in installation, maintenance and repair, with average annual wages of 43,430, also pay less than average within apparel wholesale merchandising. Another 8 percent, 143,000 people are employed in the apparel manufacturing industry where the average annual wage is 34,110 dollars. However, there is a large range within this sub industry of fashion. Whereas computer occupations, such as information analysts, are paid the highest annual wage of 73,220 on average, textile bleaching and dyeing machine operators only receive 26,440 per annum. 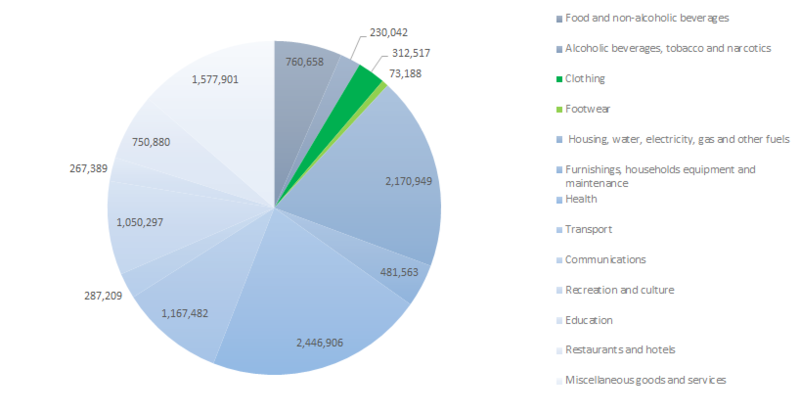 The wages for tailors, dressmakers and sewers are also in the low range with 27,510 dollars, on average. Maintenance and industrial machinery is paid around the average of this sub industry with annual wages of 36,610 dollars. Other jobs in the high compensation range are in fabric and apparel pattern making and market research and marketing. Respectively these occupations pay an average annual wage of 52,150 and 64,830 dollars. Apart from the jobs listed before, the United States has room for around 18,000 fashion designers. Their average annual wage is 73,690 dollars, meaning that they receive over 30 dollars per hour. Some of the world’s largest fashion companies are based in the United States. Moreover, the currently largest fashion company globally, Nike, is American. Nike is an athleisure- and lifestyle brand with annual revenues of 30.6 billion and a market value of nearly a 105 billion dollars. Nike offers its products worldwide and its largest markets are the United States, accounting for 46 percent of the total revenues, and Western Europe (19 percent). Most of Nike’s income, nearly 94 percent, comes from the Nike brand. The remaining 6 percent comes from Converse, which is a subsidiary of Nike. The brand’s best selling division is footwear, accounting for 64 percent of Nike’s income. With a market value of 54.5 billion dollars and 2015 annual sales of 30.9 billion dollars, TJX Companies is the second largest fashion company in the United States. TJX operates the majority of its stores in the United States and is best known for its fast-fashion brand T.J. Maxx. Its US sales account for 86 percent, with 26.7 billion dollars. The company is also active on the Canadian and European market with its brands T.K. Maxx, HomeSense, Winners and Marshalls. The third largest fashion company in the United States is VF Corporation. VF owns several brands including Lee, The North Face, Timberland and Napapijri. In 2015 VF’s annual revenue rose to 12.4 billion dollars with most of its revenues coming from the Outdoors and Action Sports division. The brands The North Face, Vans and Timberland had combined sales of 7.4 billion dollars, accounting for nearly 60 percent of VF’s total income. Currently, VF corporation has a market value of 27.6 billion dollars. Close to VF Corporation, with a market value of 25.3 billion dollars is L Brands. L Brands is the parent company of Victoria’s Secret and has most of its sales of 12.15 billion dollars, a near 93 percent, domestically. In fifth place of United States’’ largest fashion companies is sports brands Under Armour. The 20-year-old brand managed annual revenues of 4.0 billion dollars in 2015, with 3.45 billion dollar in North America alone. Under Armour is currently valued at 17.8 billion dollars on the New York Stock Exchange. 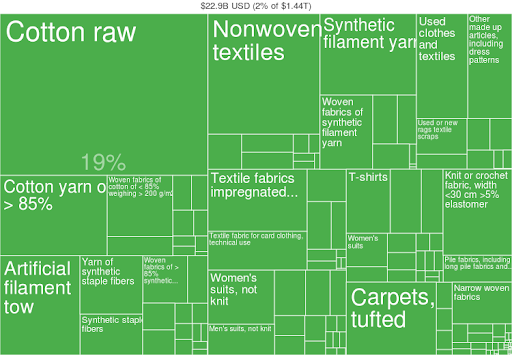 The United States are the largest importer of fashion-related products in the world. It mostly imports manufactured apparel. To cater to the large, 3,000 billion, textile and garment industry new companies are entering the market daily. Most of these companies remain rather unknown to the consumer audience, better known are the individual brands that are part of these global fashion companies. LVMH, Louis Vuitton Moët Hennessy, a French luxury conglomerate is currently the largest fashion company worldwide. LVMH’s annual revenues reached 42.6 billion euros in 2017 and the company is valued around 122 billion euros. The company operates a chain of independent stores and shops-in-shops for fashion brands such as Louis Vuitton, Fendi and Dior. LVMH does not only stand for high-end fashion, but provides for every aspect of a luxury lifestyle, from champagne (Moët) to sailing yachts (Royal Van Lent). US-based athleisure- and lifestyle brand Nike is the second largest fashion company worldwide. In 2017 Nike’s revenues amounted to 34.4.6 billion dollars and a market value of nearly a 105 billion dollars. Nike offers its products worldwide and its largest markets are the United States, 46 percent of the total revenues, and Western Europe (19 percent). Most of Nike’s income, nearly 90 percent, comes from the Nike brand. The remaining 10 percent comes from Converse, which is a subsidiary of Nike. The brand’s best selling division is footwear, accounting for 63 percent of Nike’s income. Spanish fast-fashion giant Inditex - with a market value of nearly a 92 billion dollars - is the third largest fashion company worldwide. Inditex owns brands like Zara, Pull&Bear and Stradivarius. The Spanish company is valued at 75 billion euros and its 2017 annual revenue was 25.34 billion euros. Inditex has stores is every major city in Europe, which also account for the majority of the company’s revenue. 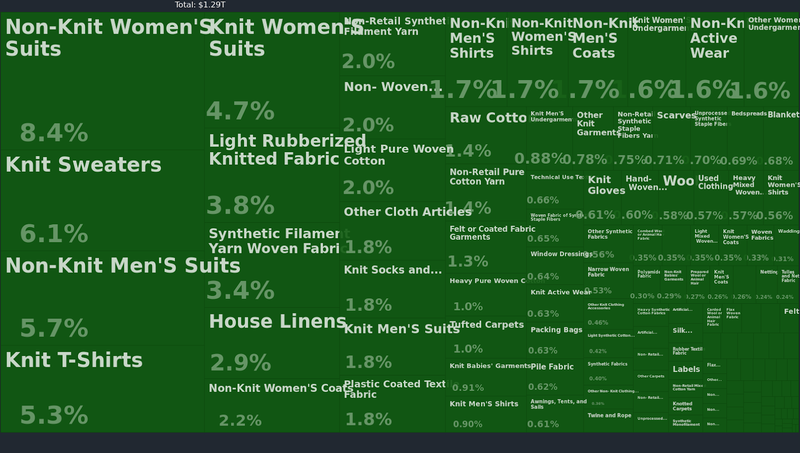 The most exported apparel products are non-knit women’s suits, knit sweaters, knit T-shirts and non-knit men’s suits. Over 40 percent of all traded footwear are leather footwear. 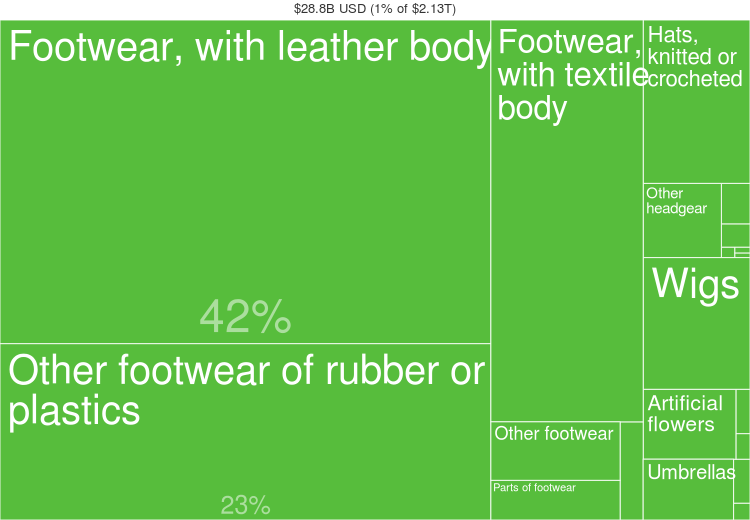 Other products that are traded in large amounts are rubber footwear and textile footwear. Also in footwear and headwear, China accounts for the largest share of all export with 71.1 billion dollars. Therefore it account for over 50 percent of the total world trade. Vietnam and Italy are the second and third largest exports of footwear and headwear, exporting respectively 13.6 billion dollars and 12 billion. The top 3 exports account for 69.6 percent of the total exports in this segment. 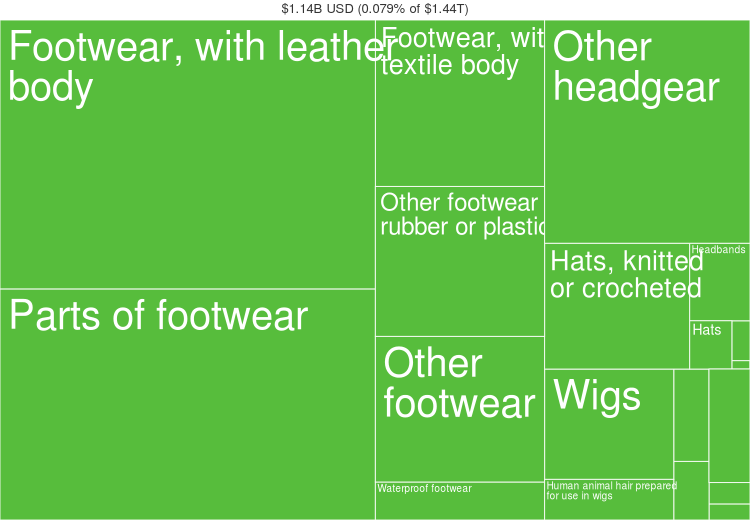 Rounding off the Top 5 largest exporting regions of footwear and headwear are Indonesia with exports of 5.59 billion dollars and Germany with 3.78 billion dollars. How many pieces of clothing are sold world wide? How many people work in the international fashion industry? 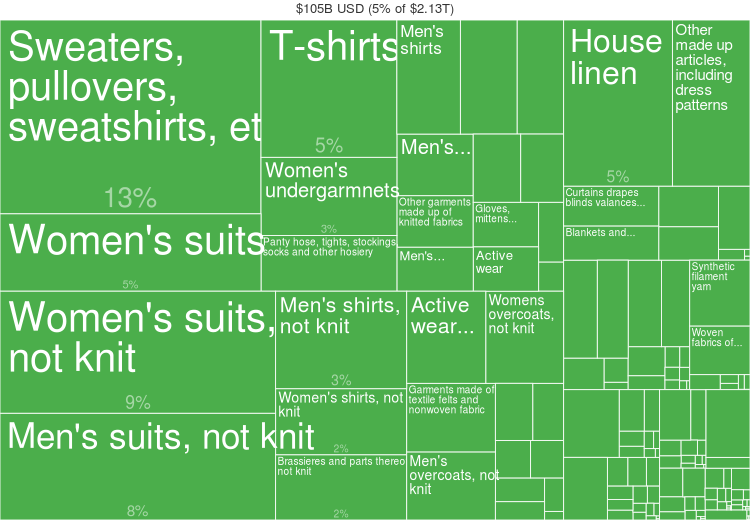 What is the total sales of clothing in the world? This is the FashionUnited page with Facts and Figures about the global and US fashion industry. For facts and figures of the fashion industry in other countries and regions, see below. The International fashion market is a leading industry well known for key players, such as Inditex, LVMH, H&M, Nike, VF Corporation, Richemont, Adidas, Fast Retailing, Abercrombie & Fitch, Prada, Gap, Dior, Urban Outfitters, Burberry. For the real-time market value and other stock information on these companies, refer to the FashionUnited Top 100. The fashion industry statistics pages are a product of FashionUnited Business Intelligence. For other data, such as the FashionUnited Top 100, the FashionUnited Facebook Index and the List of Richestest People in Fashion, refer to the FashionUnited Top 100.